We’ve got more Madden 19 NFL Playoffs simulation results to finish off Wild Card weekend. On Sunday (Jan. 6), fans will be glued to their televisions again to see who wins the San Diego Chargers vs. Baltimore Ravens and Philadelphia Eagles vs. Chicago Bears games. Here’s what our Madden 19 NFL Playoffs simulation results give us for the other 2019 Wild Card games. In Sunday’s AFC Wild Card game, Ravens’ quarterback Lamar Jackson shows early jitters as hes’ picked off. However, he managed to bounce back with a successful drive. Ty Montgomery’s two-yard rushing touchdown caps it off. As a result, the home team leads 7-0 through the first quarter. The Chargers were able to tie it up with a touchdown of their own in the second thanks to Philip Rivers finding Keenan Allen on a 94-yard strike. It was a tight defensive battle at 7-7 heading to halftime. The Ravens managed to get a field goal in the third and they lead 10-7. The visiting Chargers had a drive late in the third resulting in a short Melvin Gordon TD to make it 14-10 in their favor. Jackson throws a nine-yard touchdown pass in the fourth quarter, as the Ravens regained a 17-14 lead. However, a Chargers’ drive saw Melvin Gordon take off for a 36-yard touchdown run to put his team up 21-17. Desmond King picked off Lamar on a subsequent Ravens’ drive and Los Angeles went back to work to try to run clock. LA tacks on a field goal and it’s 24-17. Jackson had a potential heroic drive down the field. Baltimore got within 10 or 11 yards of scoring to tie things up. However, time ran out and they were unable to find the end zone. Rivers finished with 295 yards and a touchdown thrown. Jackson left it all out there, throwing for 319 yards and a TD. It’s also worth noting that Justin Tucker completed a pass for 10 yards for the Ravens during the game. Chargers running back Melvin Gordon was really the hero of the game, finishing with 81 yards and two touchdowns. The Ravens’ Ty Montgomery had 20 carries for 78 yards and a touchdown. For receiving, Allen had 147 yards and that huge 94-yard touchdown on just five receptions. Baltimore’s Michael Crabtree and Willie Snead IV each get nearly 100 yards receiving. However, Crabtree had the lone TD of the two. In the final game of NFL Playoffs Wild Card weekend, the defending Super Bowl champs visit the surprising Bears in Chicago. At a snowy Soldier Field, Nick Foles strikes first and gets Philly on board 7-0. A Jake Elliott 50-yard field goal also arrives making it 10-0 in favor of the Eagles. Unfortunately, the Bears’ offense couldn’t find much of anything in the first quarter as the defending champs held them to zero. Trubisky started heating up in the second quarter with several key plays. The Bears get near the end zone, but Trubisky’s heat stopped there. Chicago settled for a Cody Parkey field goal, cutting the lead to 10-3. However, Foles and the Eagles weren’t done, adding another TD score after a huge drive, making it 17-3 at the half. Many fans might expect Chicago to have the 17 points in that situation. Parkey came up with another two field goals in the third as Chicago inched closer to the Eagles. It was 17-9 Eagles heading to the fourth quarter. Foles found Zach Ertz making it 24-9 for the reigning champions early in the quarter. Coach Nagy went for it on a 4th and 7 and Trubisky found the end zone to get the Bears within eight. The Bears’ defense got two stops in that final quarter, but the offense struggled to get down the field. On a 4th and 16, Trubisky connected for an 11-yard pass and the ball went back to the visitors. Game over, as the Eagles take this one 24-16! Trubisky struggled to get his team into the end zone in this one as Foles and the Eagles overcame the Bears’ tough defense. Keep in mind this simulation had snow involved but it’s not in the forecast right now for Chicago. We’ll see how these games play out Sunday! 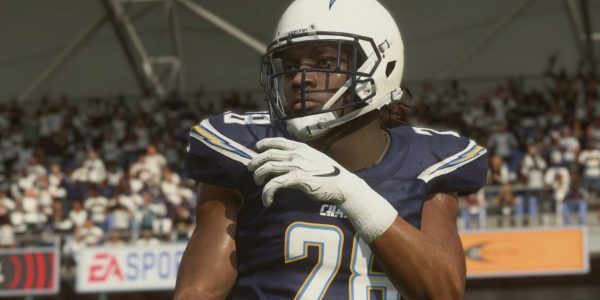 Get more news and information about the game at our Madden page here.